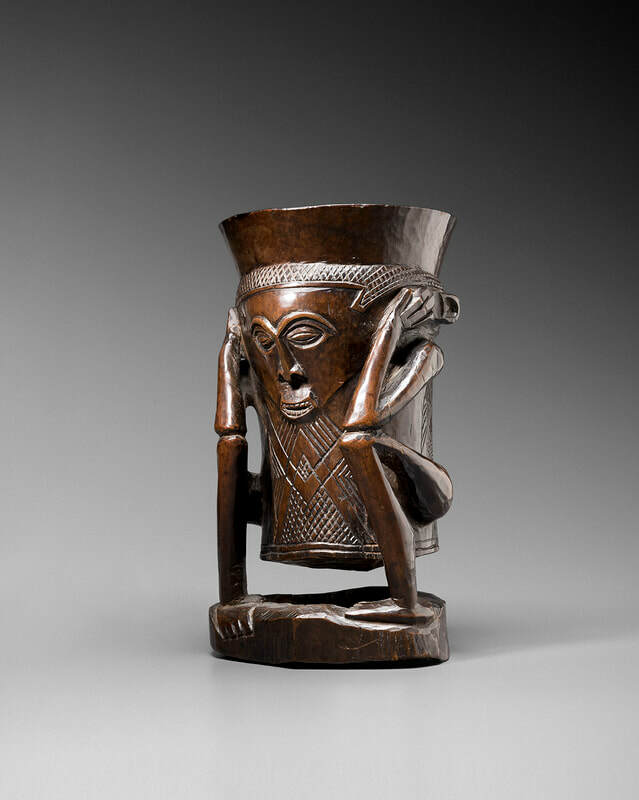 Cephalomorphic palm wine cups, as well as the – much rarer – anthropomorphic examples were reserved for the sole use of Kuba chiefs and notables, and their crafting was a true test of skill for the royal artists, making it a never ending competition for prestige, both among artists and their patrons. This particular cup represents a complete body. Transcending the functionality of the object, the bust becomes a receptacle adorned with very detailed ornemental Kuba patterns. The head and the coif come in continuation. The face presents two elongated almond shaped eyes with hemmed eyelid circled by pronounced eyebrows. The eyebrow line extends on the upturned nostrils nose. Below, the protruding mouth reveals teeth. The hair are pulled back on the temples and fine grids suggest the braided hair. 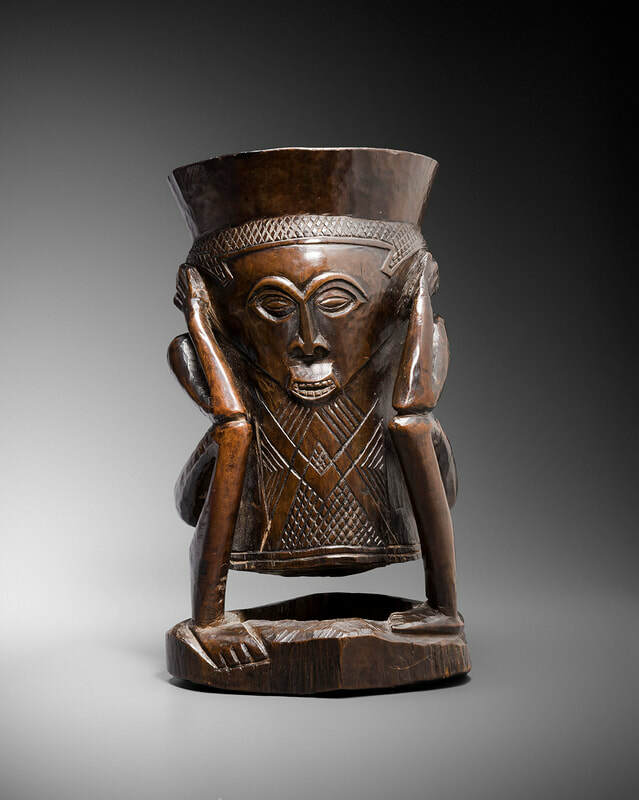 The figure with detached body from the base is squatting with arms bent on the axis of shins and hands with finely carved fingers on both sides of the head. The feet whose toes are detailed shows a most interesting position. While one is parallel to the base, the other extends on it and grips it. 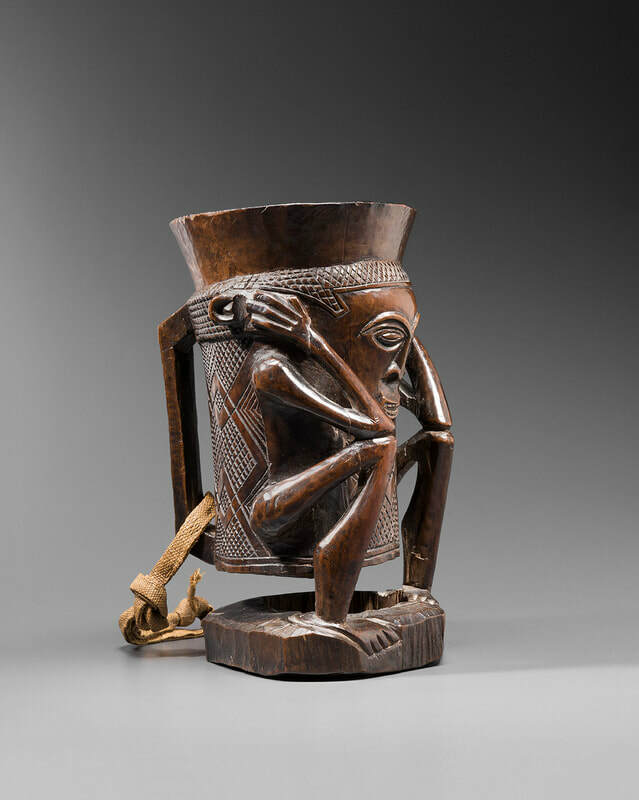 The representation of the entire body, the very particular and elaborated position of the figure and the beautiful red-brown nuanced ritual patina enhances the volumes and features of this exceptional example of Kuba cup.